How much do owner operators make after expenses? By now, you must know that the ELD mandate has gone live this December 18, as it was scheduled. All owner operator trucking companies must comply with this mandate unless they are in the agricultural industry that has a grace period. The OOIDA (The Owner-Operator Independent Drivers Association) coalition made a petition to delay the electronic logging device mandate for at least two years until the FMCSA resolves the issues identified by affected stakeholders of more than 30 organizations, but that did not work. Now we as commercial truckers are required to keep track of our HOS (hours of service) and RODS (Record of Duty Status). This mandate was written to ensure that all truckers comply with a federal rule that limits driving to no more than 11 hours a day within a 14-hour workday. Drivers must at that point be off duty for 10 consecutive hours, whether we as truckers like it or not. From December 18- 2017 through April 1- 2018, drivers without an ELD but have paper logs or EOBR (electronic on-board recorders) in order, they will receive a citation and will not be placed out of service. However, it will be wiser to start installing your logging device and avoid this hassle. Keep in mind that the highest paying owner operator jobs are going to require you to have one. Selecting an ELD that will be rugged enough to last for several years is an important decision. This can become a very complicated prcess if you do not have the right information. There are many factors to consider for compliance with the ELD mandate like the type of ELD, vendor, cost, reliability, key features, ease of install, if it requires training to use it, maintenance and if it has north-American support. While even more attributes usually imply even more expense, several of these extra devices could be utilized to save you some cash, as well as possibly also generate a favorable ROI on the acquisition. In order to succeed in the owner operator trucking business, you need to consider every expense. 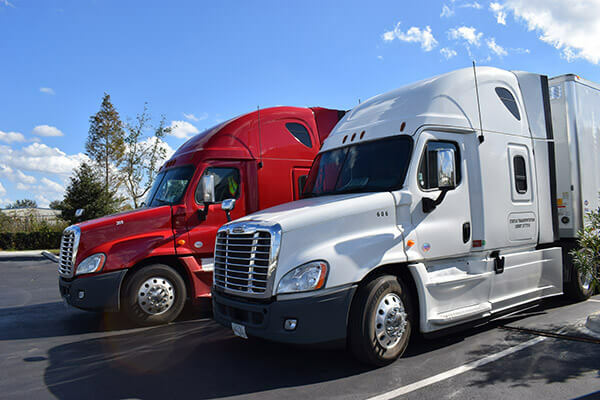 Picking the best ELD normally takes some time, even more so if when talking about owner operator trucking companies, because as an independent driver you need to pony up the dough to pay for it. To ensure that the device is not just only satisfying the technological demands, but company procedures, and that the service provider can sufficiently sustain the general organization requirements currently and also in the future. Below are some recommendations from the Status Trucks team as to what to consider before choosing an ELD. When researching for ELDs for your owner operator trucking company you will notice that there are two basic types available. The first one is called BYOD (Bring Your Own Device) that allows truckers to bring their own smartphone or tablet or companies providing them and the second is called “Dedicated ELD” that remains installed in the truck. The type BYOD requires the trucker to download an app to monitor HOS, which could be convenient for truckers to carry their ELD wherever they go if they already have smartphones and has the benefit of added features included in the app. Companies will have to pay for monthly service for each driver, instead of per truck. Some owner operator trucking companies have more drivers than trucks and they might be ending up paying their data plan also. Truckers might forget their cell phone and they will not be able to log the data. If the trucker’s phone runs out of battery, you will not be getting updated information. Truckers will most likely be distracted from the road while trying to interact with their phone, getting the risk of large fines. Some BYOD devices are not well designed for harsh environments, so depending on your industry you might want to make sure that it will work for you. The Dedicated ELD, is connected to the GPS device and is mounted on the truck. Generally, owner operator trucking companies end up paying less in the end then the BYOD type. Even though they are easy to install and efficient, sometimes they lack added extra features beyond logging. We recommend asking what added features might be important to the company. Companies will have to pay for monthly service for each truck, instead of per driver. Consider this if your company owns more trucks and has fewer drivers. This type usually has a feature called lockout that prevents driver’s interaction while the vehicle is moving, which will help to avoid any fines. Choose An FMCSA Certified ELD Provider. It is very important to keep in mind that the ELD you choose needs to comply with the basic ELD FMCSA requirements. If the ELD you have decided to pick is discovered to be non-compliant, you will only have 8 days to change the non-compliant device prior to being ruled out of compliance and also being at risk for both the trucker as well as the fleet to get a citation or be penalized. Some owner operator trucking companies want the cheapest or simplest ELDs that they can find on the market just to keep them compliant with the FMCSA mandate but they never verify if the provider is really certified. 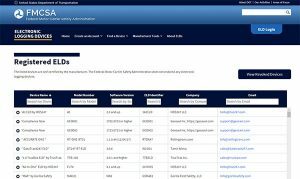 If you want to verify if the provider or the ELD model you are seeing is on FMCSA’s list of registered ELDs, take some time to look for it on this list of registered ELDs. Make sure your ELD will meet all of the FMCSA technical specifications. You need to be careful and not just pick the first provider you find or your company might regret it in the future. Consider also checking the provider’s history, because many new companies began to appear as they saw an opportunity to sell a new product to owner operator trucking companies. Several of these providers had never worked with truckers before. They just want to make an easy sale. Some of them are not even testing carefully their devices before listing them as an ELD. We recommend choosing a company that was founded prior to 2012, if they are still on business they for sure have more knowledge with drivers and they have designed a good ELD solutions with trucker’s needs in mind. Common features frequently consist of general GPS tracking, messaging, fundamental back workplace coverage, as well as HOS logs. Add-on functions for an additional fee could consist of trucker navigating, in-cab video clip training, dashboard video cameras, tire pressure tracking, and also much more. While even more functions usually suggest even more price, much of these extra devices could be made use for cost avoidance for your fleet, and probably produce a favorable return on investment. Each provider has its own exclusive mixture of features that make them unique trying to be the first choice for owner operator trucking companies. This is how you get the opportunity to customize your ELD according to your real needs. Which features are must for you to have and which ones can you live without. Consider that you will use this device for the next several years. Any type of innovation item requires excellent technical assistance and it is essential to comprehend that the ELD support is not only for truckers only. Fleet managers will also require support often. This is why many providers have a monthly or yearly fee structure as part of their monthly cots plan. It’s very important that you are confident that the provider you selected gives you stability supporting your company for the years to come, it’s just peace of mind to know that as soon as you need support you can quickly reach out to a trained representative, who will immediately provide an answer or a solution to your current situation. We recommend finding a provider that gives you a free trial period and test their assisting service before you make a decision. Make sure the provider you choose will be there when you need them most. One method to streamline the procedure is to think about exactly what ELD supplier other firms in your industry. Finally, let us talk about pricing; although many existing ELDs are not cheap there are now more providers with new technologies that have managed to reduce the cost considerably due to the ELD mandate. Some ELD Manufacturers are right now offering reasonably priced packages since the mandate took effect. Bellow, you will see a list of all the significant expenses you should consider before signing a contract with any provider. Although ELDs may appear simple, it’s still is hardware that needs to be installed on the truck, and depending on the complexity and gadgets included the cost varies significantly. This cost might be difficult to pay for smaller fleets up-front, but you can also use financing. Most vendors that required hardware purchase offer financing to owner operator trucking companies like including it in monthly service plan with an interest. You end up paying a little more but you keep your cash on hand. Almost all ELD suppliers will certainly bill a monthly cost. This is especially real for items that give a bigger variety of telematics attributes like monitoring, navigating, messaging, and so on. It is necessary to pay attention to this because, in time, this month-to-month solution generally adds even more to the complete cost of possession compared to the up-front price does. You can find ELD suppliers that will certainly offer an installer at your area with no extra cost, however, others will definitely charge for installs and you must be aware of it and take the precaution to ask in advance if this fee will apply. If you have your very own repair shop, it’s usually best to have the ELD company train you or your people by their professionals at least on the first installation, then you’ll have no trouble keeping the warranty. Several ELD use their very own exclusive display screen as well as communication interaction device, and the data cost of transferring information is usually included in the monthly cost. Various other systems need owner operator trucking companies or the driver to provide the tablet or smartphone to be used as the screen as well as interaction. In these situations, you will certainly need to spend this extra cost for a regular monthly data plan. This is a BYOD type ELD and is consider being a very user-friendly device at an affordable price because it has no upfront cost, you only have to sign a 3-year contract with a monthly payment of $35. Features of this device include two-way messaging, DVIR, IFTA, Engine Info, Truckers can make log corrections, Document Scanning, It works with iOS and Android. This is a Dedicated type ELD and it markets itself as one device, one cable solution. The up-front cost of the device is between $750 and $800. The monthly cost is around $30 for the basic plan. Features of this device include two-way messaging, DVIR, IFTA, Engine Info, Truckers can make log corrections, Document Scanning, and Navigation. This is a Dedicated type ELD is very durable, dependable, and one of the most accurate systems in the market. It is available with no up-front cost, the monthly payments are around $35, it’s easy to use. The customer support it has been rated very highly. Features of this device include two-way messaging, IFTA, Truckers can make log corrections. This is a Dedicated type ELD, it is called the Cadillac of ELDs. The up-front cost of the device is around $1,199. The monthly cost is around $43. Includes other available systems you can operate as needed like fuel consumption, Monitor engine status, and tire pressure and fault codes. Features of this device include two-way messaging, DVIR, IFTA, Engine Info, Truckers can make log corrections, Document Scanning. This is a BYOD type ELD, it’s available at an affordable price and offers similar features as other more elaborate devices. Features of this device include two-way messaging, DVIR, IFTA, Engine Info. We hope this Status Trucks review of the top ELD devices will be helpful when choosing the right service for your owner operator trucking business. For this and other useful blog posts on how to succeed in owner operator trucking, please sign up for the Status Trucks review blog.